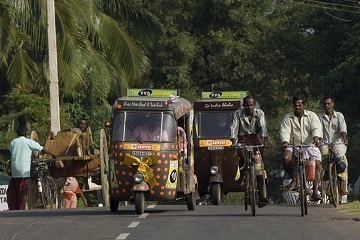 Dating back to the genesis of The Travel Scientists a decade ago our pioneering Rickshaw Challenge is now often copied but never bettered as our long experience and local knowledge allow us to provide the very best in crazy three-wheeled travel through India. 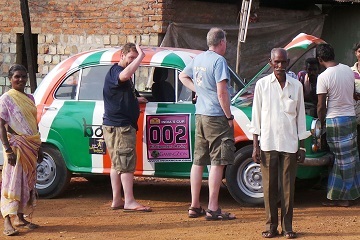 Race these iconic vehicles through remarkable landscapes, meet the fascinating locals and savor the sights, sounds and tastes of Southern India. Along the way see the magnificence of the country, from the crystal clear waters of the ocean to the forested hills inland this epic journey lets you experience them all as you make your way between some of the most exotic and ancient locations in the world. 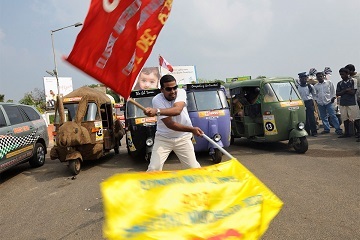 With five different events to choose from spread across the year the Rickshaw Challenge, listed by Lonely Planet as one of its 10 Greatest Adventures, is simply the best way to hit the road and explore the real India, share in the camaraderie of your fellow teams, and have the experience of a lifetime. 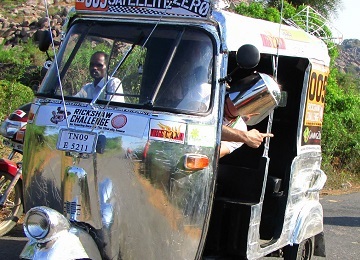 With a variety of packages the Rickshaw Challenge can provide both an experience for the adventurous and an adventure for the experienced. 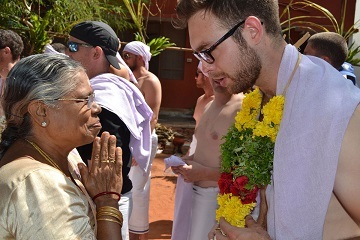 Whether you go bare-bones and do the heavy lifting, or let our professional team take the strain, we at Travel Scientists guarantee a journey through Southern India you’ll never forget. 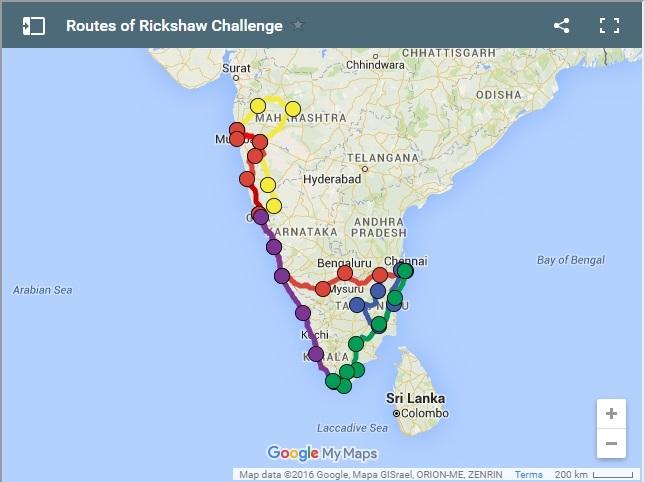 If you’re not sure what this is all about then we can try to help you out with the wheres, whys and hows of the Rickshaw Challenge. Take a gander below, and if you have more questions, we’re more than happy to help. When people think about travel to India, they think of visiting the Taj Mahal, the ghats in Varanasi or the forts and palaces in Rajasthan. 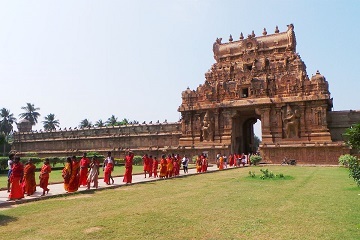 South India by comparison is less visited than the touristic hubs of North India, which is why we prefer to stay in the region of South India for our adventures. Why not? 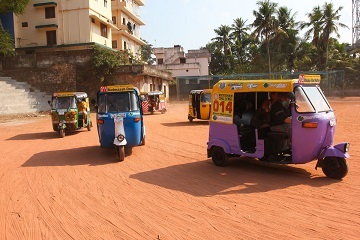 The auto rickshaw is the ultimate South Asian vehicle, so in a way you’re embracing the local culture while getting your adrenaline up at the same time. 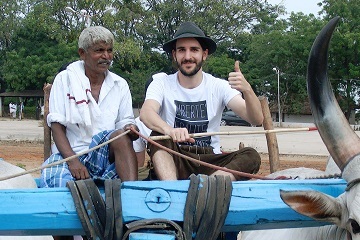 Riding an auto rickshaw is a lot of fun, and it’s a unique way to see the country. 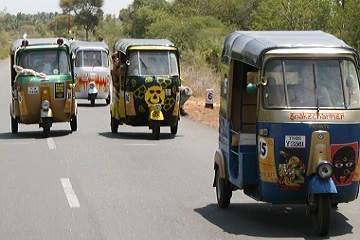 When you sign up as a team to the Rickshaw Challenge, your rickshaw rental is included in the sign up price. 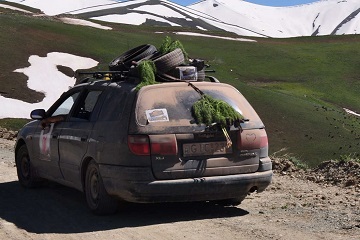 We’ll give you the barebones needed for your rickshaw adventure, and if you need any assistance, we have our trip manager and our service van available, otherwise the rest is up to you! 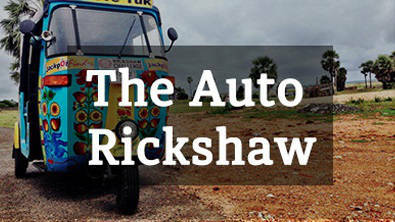 So what is an auto rickshaw exactly? It can be thought of as a three-wheeled tricycle with a fuel efficient lawn mower engine. 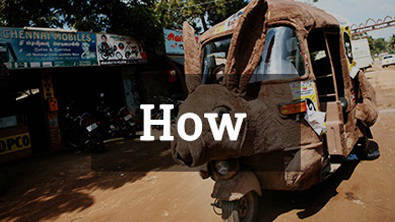 You cannot avoid the auto rickshaw if you’re in India, since it’s the quintessential mode of public transport in any Indian town, city or even village. 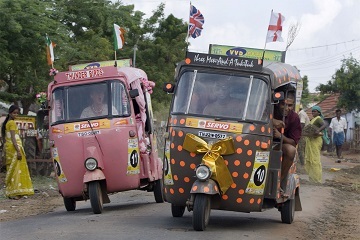 The Rickshaw Challenge might all be about laughs and adventure, but we also want to give something back to the community, which is why we have teamed up with Round Table India. It’s best to check with your doctor if you need any vaccinations. Most people opt to get vaccinations against Hepatitis A and B, Diphtheria, Polio, Tetanus, Typhoid Fever and maybe Cholera. Most travelers to India will require a tourist visa. Some countries can apply for the eTourist Visa online, and collect it at the airport. If your country isn’t on the list, then you’ll want to enquire about the procedure at your local Indian embassy. One of the best things about exploring India is trying out the local food. South India is known for its “thalis” or “meals”, a complete meal made up of rice, various curries, chutneys and pickles, often served up on a banana leaf. 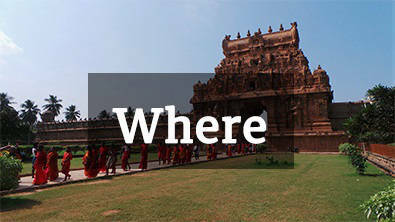 Also try dosas (a fine pancake made from rice flour) and idly (steamed rice cakes). Tamil Nadu is crazy about its coffee, which is unique to South India, so you must give that a try. Other refreshing drinks include lime soda, fresh coconut water and sugar cane juice. 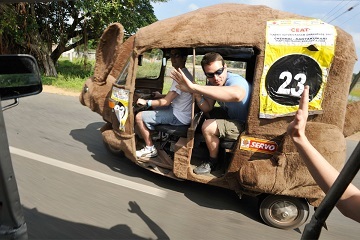 If you’re coming on the Rickshaw Challenge to relax on a beach, you’ve come to the wrong place. This is a challenging adventure where you will have to step out of your comfort zone. It will be a challenge – you will get lost, you will break down and you will find yourself in parts of India where very few tourists pass through – but it will be worth it. 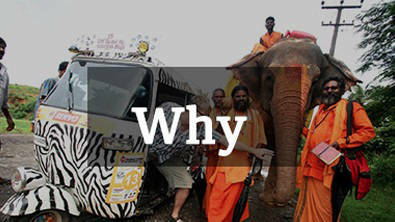 When traveling in India, we ask that you respect the culture and be a responsible tourist. 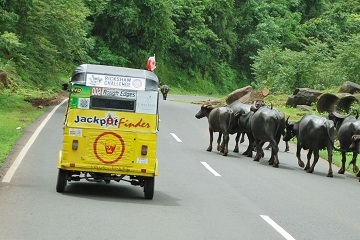 We highly encourage funny and crazy antics, but take care not to offend the locals, drive recklessly or break any laws. 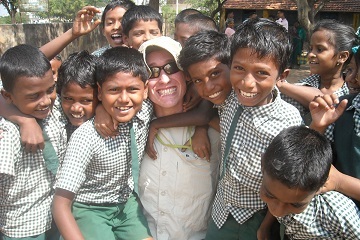 You’ll find India is a hospitable country, where people are more than happy to help you and will be curious about you. Don’t take offense at people staring at you, just think of yourself as a novelty and smile back. Do take care of your belongings at all times – especially if monkeys are around.